Kentucky is seven weeks into its 2018 legislative session and there are numerous important issues that demand lawmakers’ attention. Pensions and budgetary issues have, and will continue to consume much of the legislative oxygen this session. However, there is another glaring issue of concern that lawmakers absolutely need to address this legislative session – prison overcrowding. The overcrowding in Kentucky’s prisons has reached crisis level, with most facilities are operating over capacity. Kentucky is now the 2nd highest incarcerator of women and holds the 9th highest overall incarceration rate. In the span of 2012 to 2016, the state’s prison population ballooned by 32 percent. What is more staggering than these statistics is the cost. The Kentucky Department of Corrections has requested $700 million just to maintain the anticipated needs the costs for the upcoming fiscal years. But, given the projected 19 percent prison population growth, taxpayers will likely be footing a $600 million bill to keep up with the projected prison growth. Many of these costs can easily be avoided by diverting low-level, nonviolent drug offenders into evidence-based alternatives to incarceration, such as drug courts, rather than incarcerating them. The former being a much less costly, and more effective option. The savings would be significant and immediate because the primary driver of Kentucky’s burgeoning prison population is low-level drug offenses (Tweet that!). Since 2012, the number of folks incarcerated for drug possession has doubled, and there has been a 38 percent increase in admissions for low‐level Class D felony offenses. House Bill 396, sponsored by Rep. Kim Moser and Rep. Jason Nemes, includes many of the reforms recommended by the Governor’s Criminal Justice Policy Assessment Council Justice Reinvestment work group. These reforms include restricting the use of incarceration as a sanction for technical violation of parole and probation conditions, and instead would expand the use of swift, certain, and proportional sanctions to address this behavior. Other provisions include reclassifying first and second drug possession as a misdemeanor and creating a local fiscal incentive fund that would provide resources to counties to increase treatment and supervision at the misdemeanor level. This is a particularly important reform given the scope of the opioid crisis in Kentucky. We have all heard that society cannot incarcerate its way out of the opioid crisis. Kentucky should reserve its prison beds as punishment for those who are trafficking drugs into this state, and not those who are addicted to them. This reform ensures that addicts who are caught with opioids for personal use, or another abused controlled substance, are diverted into treatment rather than incarcerated. House Bill 396 would avert 78 percent of the prison growth expected over the next 10 years and afford the state a cost savings of more than $335 million. 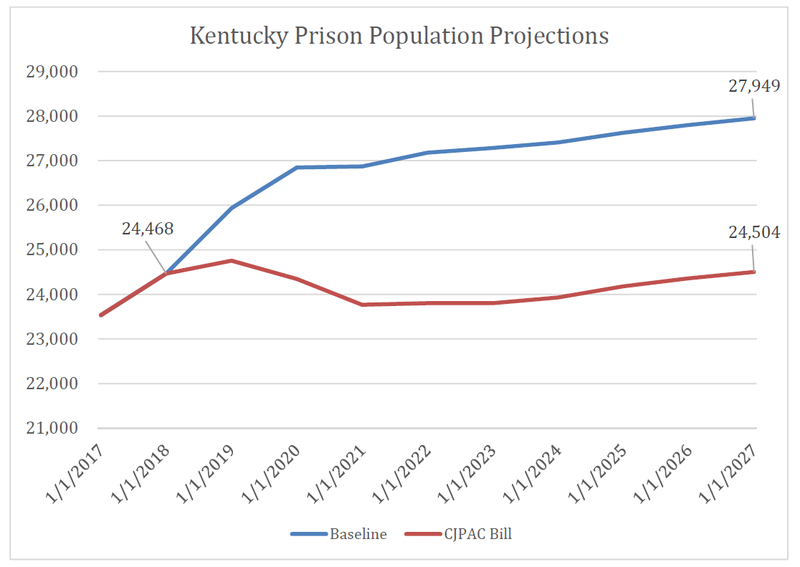 Kentucky’s ever-increasing prison population is not going to slow down without legislative intervention. In fact, it will only become increasingly worse. A solution is now on the table for consideration by lawmakers. A solution that promotes cost savings and public safety. The time to act is now.